The St. Francis Xavier Preschool Program recognizes 3 – 5 years old children are brimming with natural curiosity. Our classrooms are designed to promote learning through personal interest and exploration. Our curriculum provides opportunity for continuing age and developmentally appropriate instruction that view learning on a continuum. Curriculum is defined by the Diocesan Schools Office Early Childhood Standards/Curriculums and by the State of Arizona. Religion: “Stories of God’s Love” is a religion readiness program that helps young children take their first steps on their journey of faith. Students also visit the Atrium weekly where they will learn about Jesus through independent activities. Language: Our 4 year old and 5 year old programs use “Happily Ever After” early literacy series and “Putnik Phonics”. Reading readiness skills, verbal communication, expanding vocabulary, pre-writing are all important components of the program. Math: Our 3 year old program uses “Math Their Way”. This program stresses using math concepts in a child’s everyday life and is mostly manipulative materials. Our 4 and 5 year old programs use Eureka Math. Eureka Math is a curriculum presenting math in a logical progression from PK to 12th grade. Students will gain a strong number sense through the use of manipulative. Science: The class discusses weather, seasons, space, plants & seeds, animals (living & prehistoric), living vs. non-living, care of environment, and the 5 senses, the human body. Art: Children create and experience art using different media. Social Studies: Self, family, community, holiday, presidents, cultures around the world. We also use the Sanford “Harmony” program which is designed to make a difference in how students think about and treat each other. By promoting positive relationships between students, this program promotes respect and understanding of differences among all children. The ultimate goal is to improve student cooperation, empathy and mutual respect as well as foster greater inclusion and connectedness. 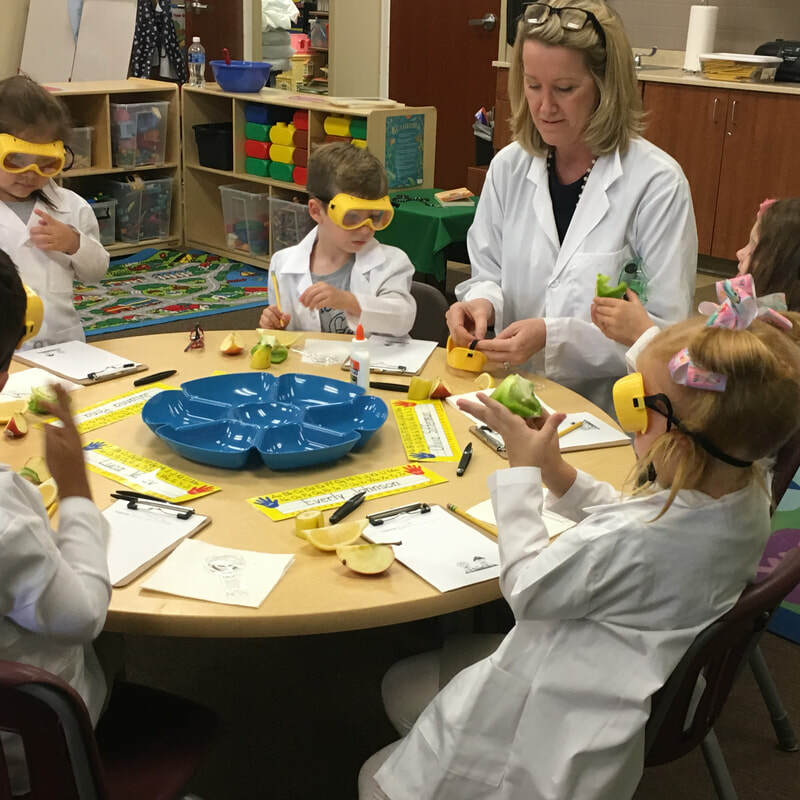 Preschool students participating in "Blooming Explorers" which develops learning skills and practices by providing experiences facilitated by trained parents who act as "lead scientists" guiding the "junior scientist" through activities. 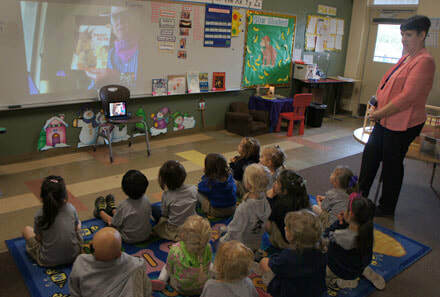 Mrs. Johnson's 3 year old preschool class - family members visit virtually. Click on the picture to read the article.